Geothermal Energy is another type of renewable energy resource that makes use of the large amounts of energy stored as heat in the water deep below the Earth's surface with the most prominent and visual example of this coming from "Geysers" and "Hot Springs" ejecting large columns of very hot water, steam and gases high up into the air. In fact the word "Geothermal" comes from combining together the two Greek words of Geo, meaning "Earth", and Therme, meaning "heat", with the resulting word "Geothermal" actually meaning "heat generated from the Earth", then the expression "Geothermal Energy" literally means "heat energy generated from the Earth". Geothermal energy is obtained from the hot areas under the surface of the earth that remain at a relatively constant temperature all year around day and night. Once available, geothermal energy can be used either directly or indirectly as an alternative energy resource to both heat and cool our homes. This naturally occurring and free energy is extracted by a series of pipes filled with water buried below the Earths surface. This hot water is then used in our homes for heating, called Geothermal Heating, or to generate electricity, called Geothermal Power. So how does it work. At the Earth's core, some 4000 miles below the surface, temperatures can reach over 9000 degrees Fahrenheit. This incredible amount of heat originated four billion years ago in a fiery combustion of dust and gas as the Earth was being created. Many scientists believe that radioactive decay of the inner core keeps the heat generating and flowing outward from this inner core to the mantle of harder rock which surrounds the core. When the temperature and pressure is high enough, some of this mantle rock melts. Then, because the melted rock or magma is less dense than the surrounding rock, it rises and moves slowly up to the Earth's crust. Sometimes the hot magma reaches all the way to the Earth's surface as a volcanic eruption, but usually the magma remains underground and heats the adjoining rock as well as any water that has seeped down through geologic holes, cracks and faults in the Earth's crust absorbing the heat as it travels through these hot rocks. Some of this water, whose temperatures can reach as high as 700 degrees, travels back up through cracks to the Earth's surface and emerges as hot springs, geysers or pools of boiling mud. 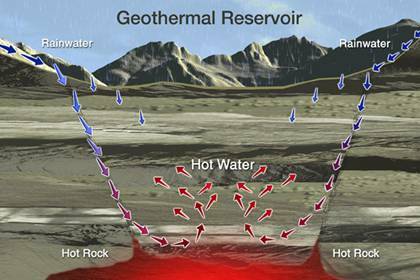 Far more often, however, the water and magma becomes trapped within the rock, forming a natural underground geothermal reservoir. It is these underground geothermal reservoirs that are able to give us another type of alternative energy resource with incredible potential. Direct Geothermal Energy - this is where the hot water is available either on or very close to the Earth's surface and can be used directly for heating, bathing or washing. Ground Source Geothermal - this is where the geothermal hot water is below the ground but not too deep allowing easy access of the geothermal resource using heat absorbing pipes or bore holes. Geothermal Power Plants - these harnesses the extremely hot water or steam using vertical bore holes drilled deep underground and then uses the available super heated geothermal water and steam to generate electricity. For domestic applications, one way of extracting this heat energy is by the use of a Geothermal Heat Pump. The geothermal heat pump doesn't create electricity, instead it circulates a thermally conductive liquid mixed with water through long pipes called an Earth loop buried up to 12 feet underground, operating on the same principle as the domestic refrigerator but in reverse. A Geothermal Heat Pump, also known as a "Ground Source Heat Pump", is a very efficient way to heat and air-condition our homes and buildings as it can move heat in two ways: during the colder winter months, low temperature heat is withdrawn from the ground (the heat source) for direct use in heating buildings and other structures. In the hotter summer months, the geothermal heat pump operates in reverse removing the heat from the building and dissipating it back into the ground. As a result of this simple process, direct use geothermal heating is becoming very popular for the home owner because it provides a cost-effective alternative to expensive oil or gas home heating systems. Energy savings using a ground source heat pump can be substantial over a long period of time. Geothermal power on the other hand uses extremely hot water heated by the underground magmatic activity which is pumped to the surface and used for electricity generation. Once this super heated water reaches atmospheric pressure it turns to steam where it is used to operate steam-powered turbines and generators. Geothermal power plants are becoming more common in volcanic areas and countries such as Iceland, were it produces over a quarter of their energy needs. The main advantages of Geothermal Power is that it is clean, cheap, no additional fuel is needed resulting in no greenhouse gases or air pollution. However, some disadvantages include ground water and waste water pollution, geographically restricted and high maintenance costs. But the biggest disadvantage is that the closer you put a Geothermal power plant to an active volcano or heat source, the larger the potential operational problems you can have. To learn more about "Geothermal Energy" and how you can use it to heat your home, or to explore the advantages and disadvantages of using Geothermal Energy as an alternative energy resource, visit http://www.alternative-energy-tutorials.com today and find lots more good quality and free Alternative Energy Tutorials as well as information and articles about the many different types of alternative energy sources available for the home. (c) Copyright - Alternative Energy Tutorials. All Rights Reserved. Very informative read here. A great introduction of geothermal energy as well as the types of geothermal energy. in addition to this, geothermal direct uses can also be utilized for industrial uses such as for pasteurization and heating farms. Geothermal power plants like bulusan geothermal plant generate and provide cleaner and a much reliable form of energy for electricty consumers. You may or may not of heard of a geothermal heat pump system. If you have, than you have probably even though about installing a system and seeing how it works. I'll give you all the details and the low down to what the system is, how it works and how much money save you save.